As a landlord, you know the importance of maintaining a clean aesthetic inside and outside of your rental units. Appearances are everything when it comes to the rental business, and apartment power washing is one of the best ways to keep up appearances! By hiring a professional company, you can rest assured that all technology is used according to specifications and the outside of your buildings will look as good as new. 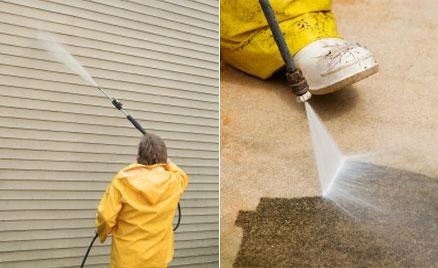 What are the advantages of pressure washing your buildings, you ask? Anyone in the business of renting properties for a living will know just how vital it is to at least maintain property values to prevent monetary loss. In fact, professional power washing can help increase property values by making sure that your buildings are in ideal condition. If you have it in mind to sell your apartment complex at some point, increasing your property&apos;s value is in your best interests, and that includes focusing on structural integrity and aesthetics. You must ask yourself: what kind of people do you want as tenants? If apartment buildings are filthy, dilapidated, and unkempt, then chances are that the people living in them will be too! Regular pressure washings can boost tenant morale and motivate them to clean their own units. No one wants to live in a building covered by filth and debris. Not to mention, it is an unhealthy environment for tenants to live in if bacteria, mold, and other pollutants are left unchecked. Are you looking towards the future and wondering how much money you&apos;ll need to invest into repairs? The fewer steps you take in order to preserve your buildings, the more repairs that will surface down the line. Apartment power washing is an affordable and straightforward way to preserve the integrity of your buildings and prevent mold, mildew, wood rot, and severe cracks from developing. Tenants have rights, and that includes living in a clean and cared for environment. If you start to neglect your duties as a landlord, you may find tenants filing complaints against you with the city. In fact, this could cost you quite a bit of money in terms of fines. The way your apartment buildings look is the type of people it will attract. Anyone can have a good credit score, but you need to also consider the type of people living in your buildings. You will want responsible adults that take care of the units, take out the trash, and don&apos;t cause you undue stress with their antics. Pressure washing may not be a cure-all, but it can certainly help you take the necessary steps towards attracting the tenants you want! If you want your buildings to advertise themselves and to last for a long time, you need professional local pressure washing services! Not only can a clean building increase property values, but it can rid you of potentially bad tenants and prevent your buildings from suffering damage.